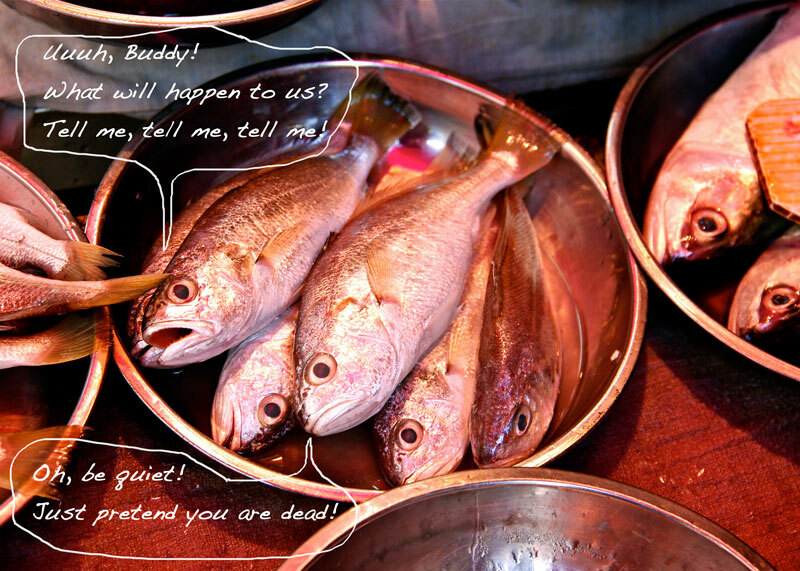 You are here: Home > Archives > Broiled Yellow Croaker, worry about the fish smell? 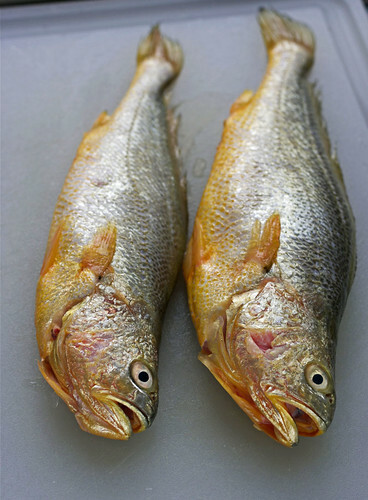 Broiled Yellow Croaker, worry about the fish smell? I literally grow up eating fish pretty much on the daily bases. My parents loved fish, or anything that grows under the water. 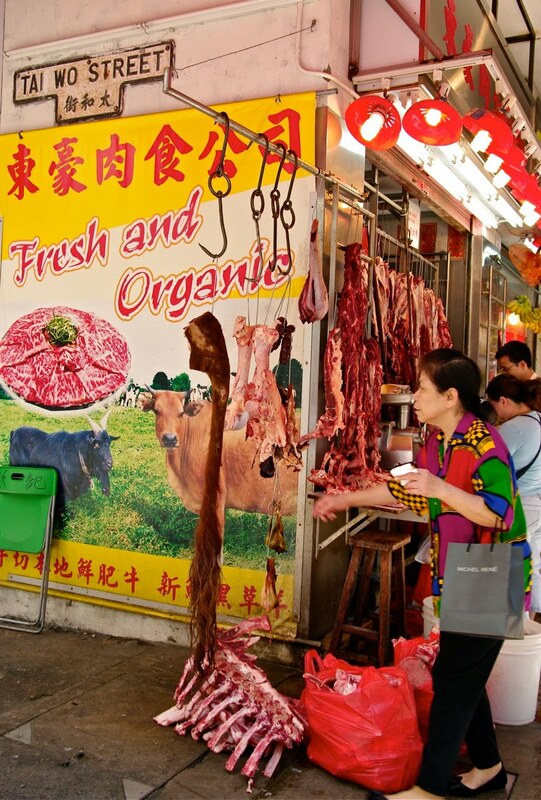 It has to be fresh, mostly alive when they buy them. 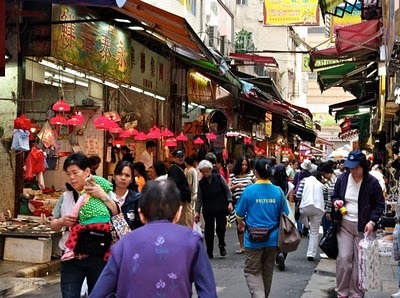 The other day I went to the local wet market in Wan Chai to look for fresh fish. They call it “wet” because the ground in the market is wet. Make sense! I like to go there often to see local people’s way of living. 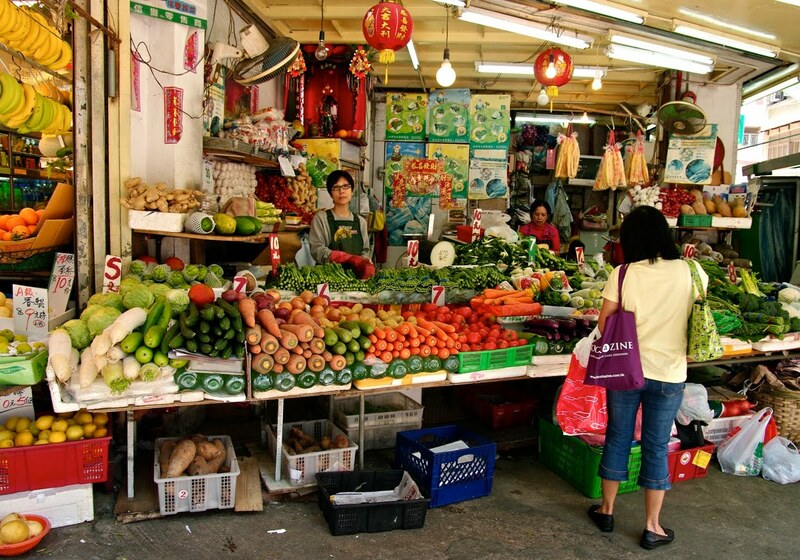 There is something about market that teaches you the importance of life, the energy, and the diligence. 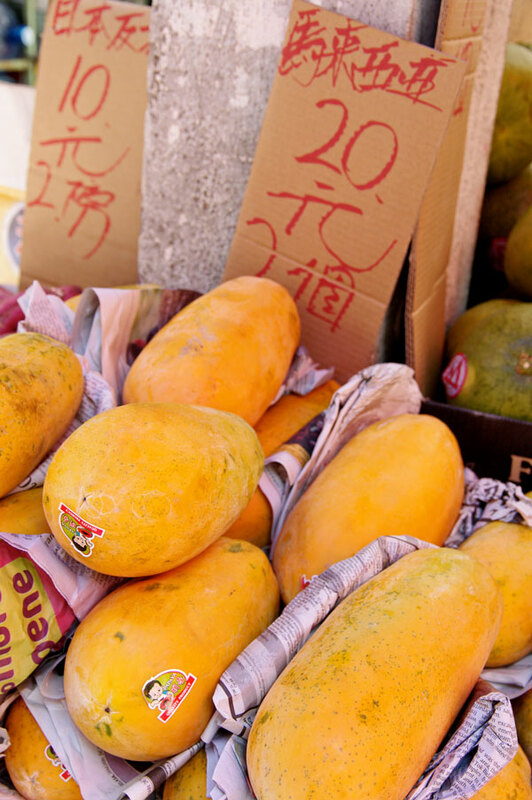 People sell, people buy…, beautiful produce…, hard working locals to get by their daily needs. Things that you don’t feel the same way from the big grocery stores where everything is nicely prepacked and displayed. 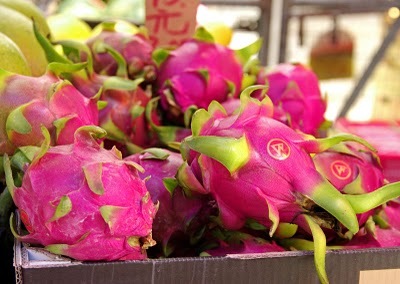 I took my camera with me last time to see the local produce through the lense. 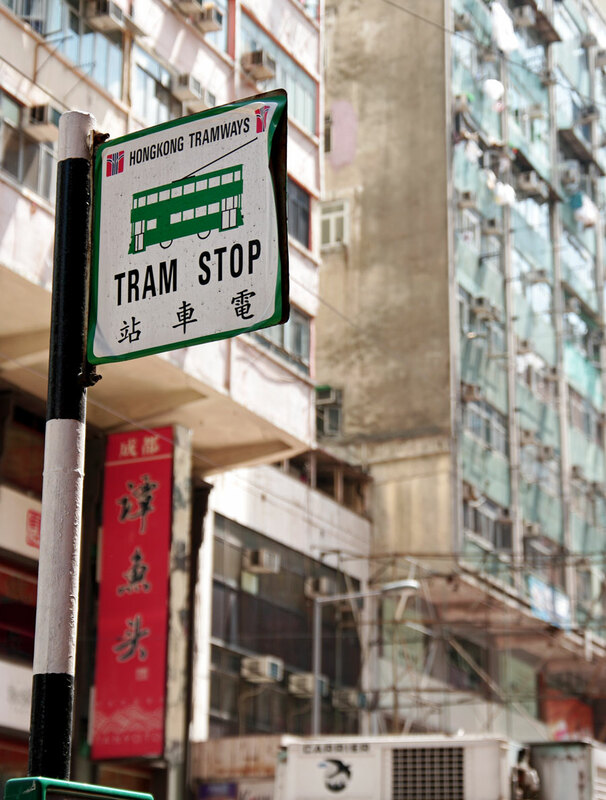 This is the local tram stop at Wan Chai market. It only cost HKD$2 (25 cents US) to use it. One of the market entrance. 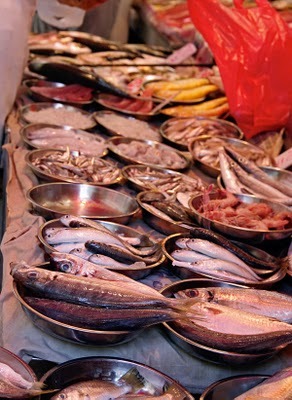 one of the many fish stands. 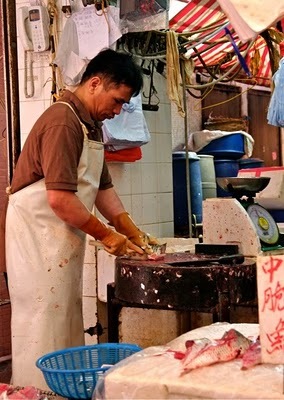 A man cleaning fish for his customers. 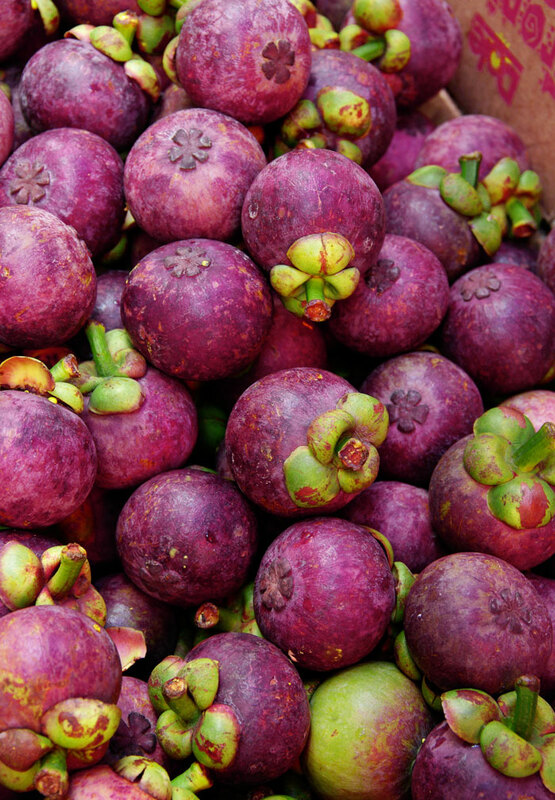 Not a big fan of these fruits. one of my favorite tropical fruit. White flesh inside, very sweet and juicy. Not a big fan, either. The kindest lady I know in the Wan Chai market. 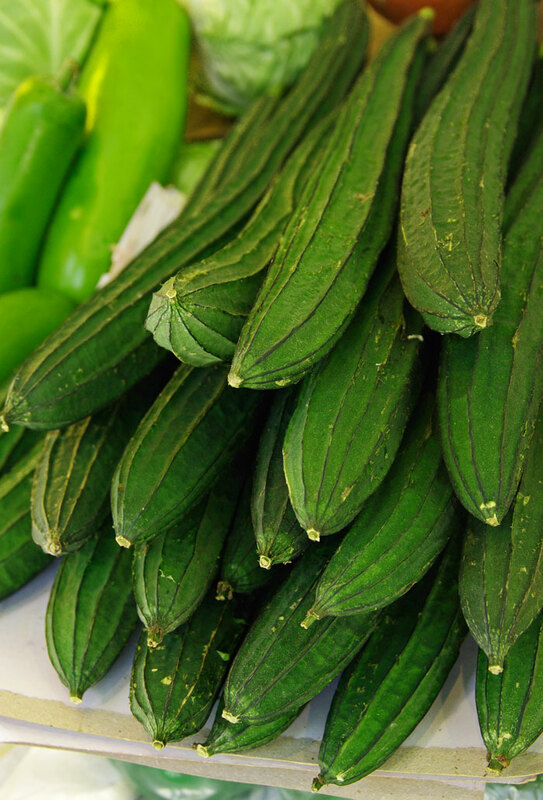 even if I buy just a single zucchini. and the lady on the right bought it. The yellow croaker, the star of today’s posting! One of my favorite fish and my kids just love them. 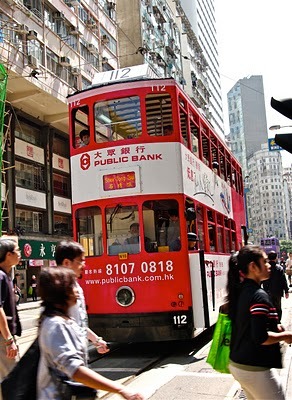 Now, we will end the tour of the market here. More comes later! I will share with you how you can enjoy these yellow croaker in a simple broil method. Pull your sleeves and let’s get to work on this fish! 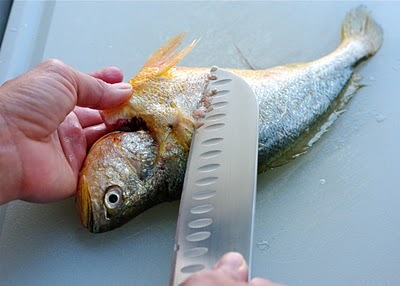 Some people hesitate cooking fish because of the smell. Yes, if you don’t treat the fish well, it will smell up your kitchen pretty bad. 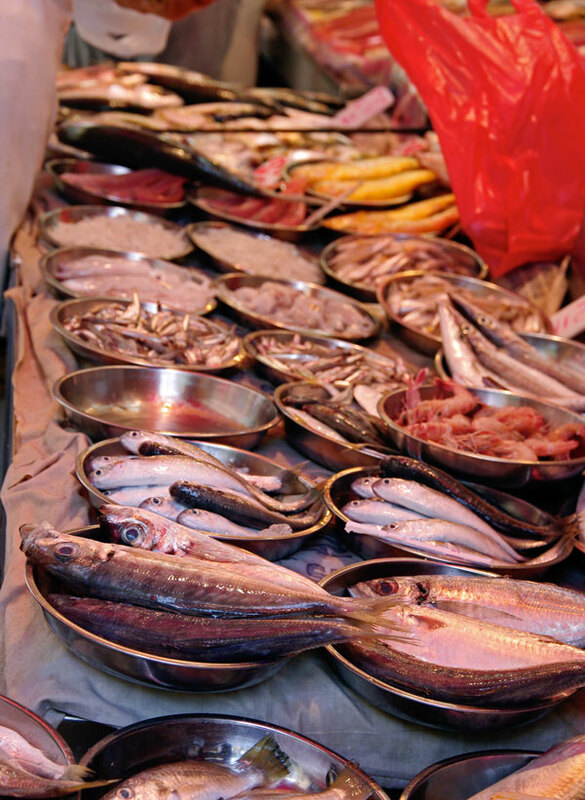 Always look for fresh fish. That is the first step. 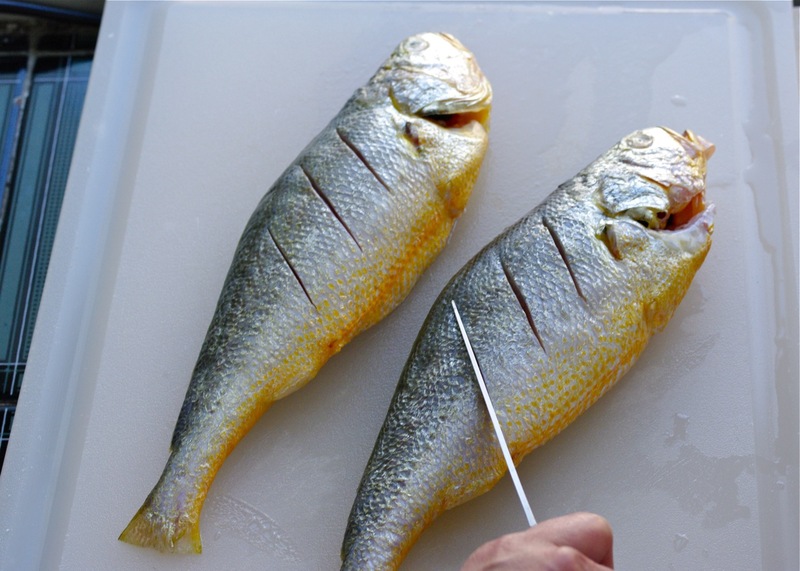 Here are some tips how to choose fresh fish. 1. Look at their eyes. Bright and clear is the one you need to look for. 2. Smell it. 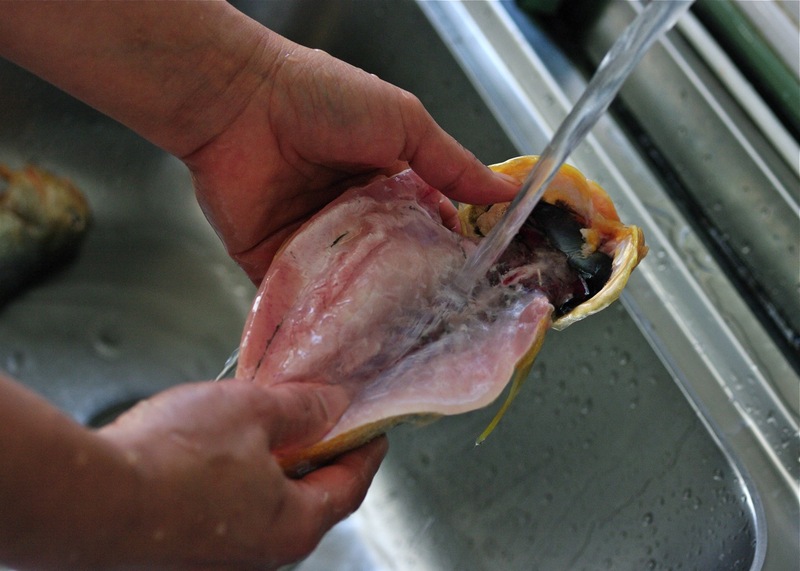 Fresh fish is not stinky. It should smell like clean water. 4. Look for bright red gills. Old fish will have darker brownish gills. So you got the fish, the whole fish? You would think your fish man cleaned all the scales and get rid of inside stuff? Well, unless he has a crush on you, the chances are NO! and you need to remove as much as you can. The fish guys usually remove the body part’s scales very well but not around the head. So, shave his head, please! 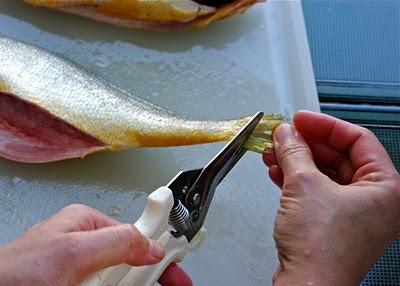 Remove more scales around the fins as well. They are the ones get erected in the heat and get burned fast. Besides who eats the fin? Well, these guys are all shaved and trimmed, slick! Here is what you need to decide. I would like to eat this fish for dinner that night so I let them chill for about 6 hrs until ready. The amount of the salt in the recipe is based on that time. If you don’t have much time, increase the amount of salt. Also, you can freeze these guys for later use. keep them in freezer up to couple of month. How to thaw? You can use microwave but I prefer this way. Dunk the entire zip lock bag in the cold water for 20 minutes. They are as fresh as before! 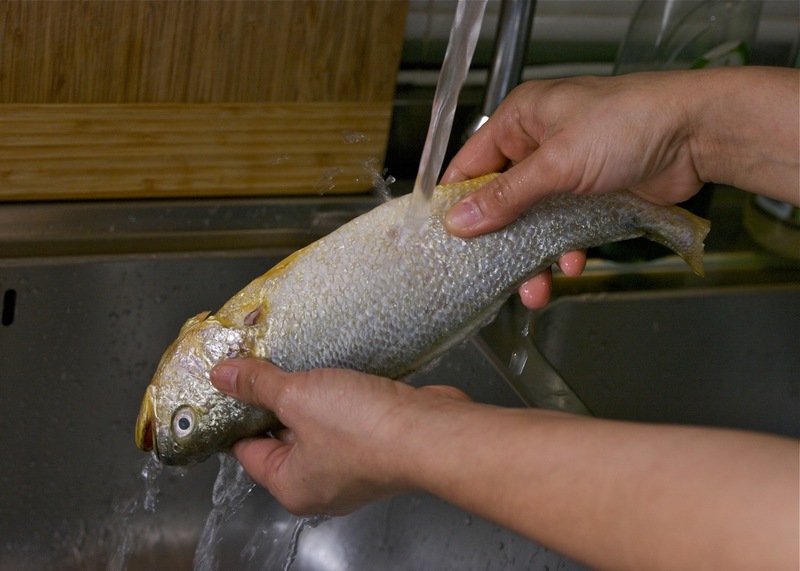 First, Wash the fishes again to remove excess salt. Set aside. I will show you my secret of broiling fish without the worry of smell during cooking. These are the peels of fruits, and veges. any roots or leaves of veges such as celery, you name it. Even watermelons or cantaloupes peels are good to use. Do not throw away those peels. Recycle, baby! 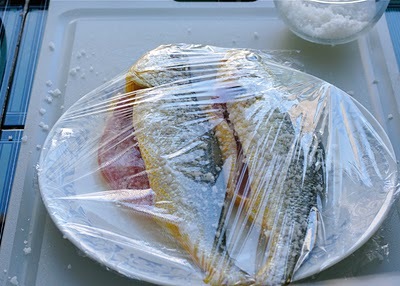 Put them in a big zip lock bag and keep them in the freezer. 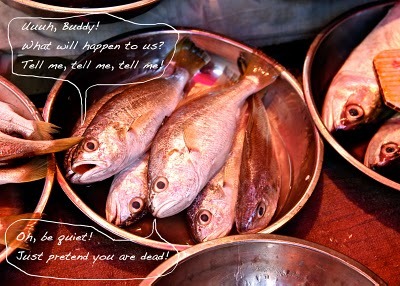 They are the fish smell busters! 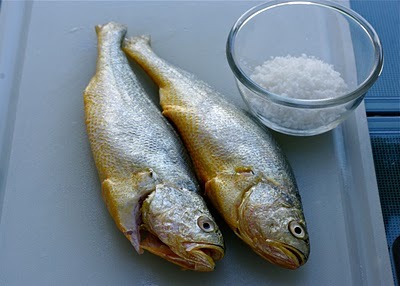 Not only that, they infuse the fish with nice aroma, and keep them moist and flaky. I even use them when roasting chicken. Wonderful! Line a jellyroll pan with foil and spread the peels. Easy clean up! You need a lot to cover the entire pan. Place a rack on top of the peels. 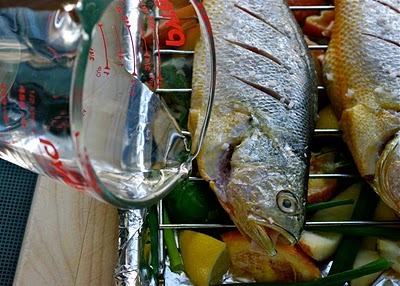 Remember to spray the rack with oil spray, otherwise your fish will stick on. 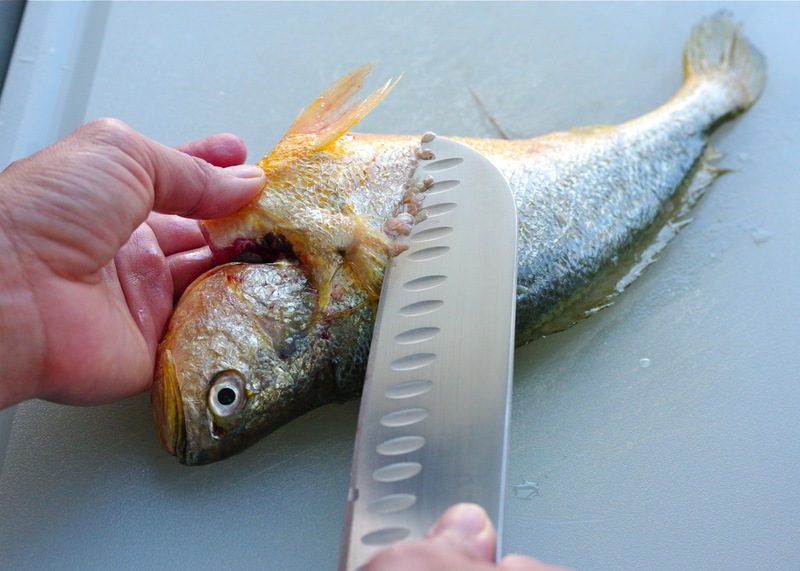 Now, go back to the fishes and give them a few slits on both sides. This will help the steam to escape and help even cooking. 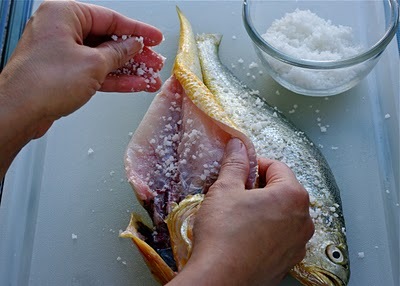 Place the fish on top of rack and sprinkle just a little more salt on top if you like. 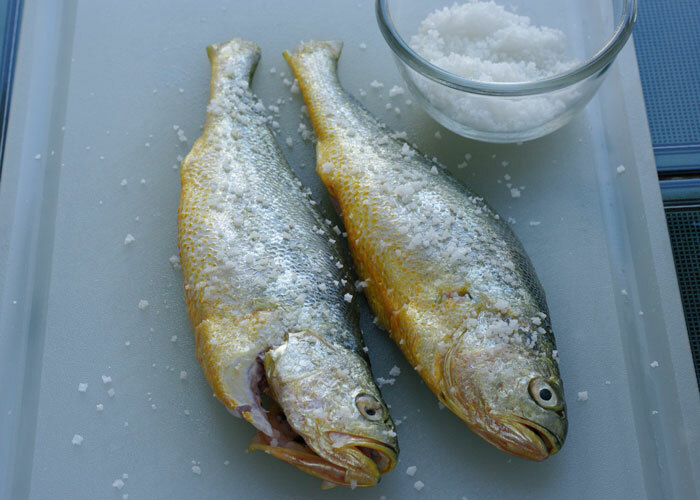 If your fish has been cured with salt for a long time you don’t need to add more salt. Pour about 1/4C of water in the pan. This will prevent the peels from burning. Put them in preheated hot oven with broil setting, about 3 inch below the heat. Broil for 8-10 minutes each side. Always check during that time to make sure they are not burning. 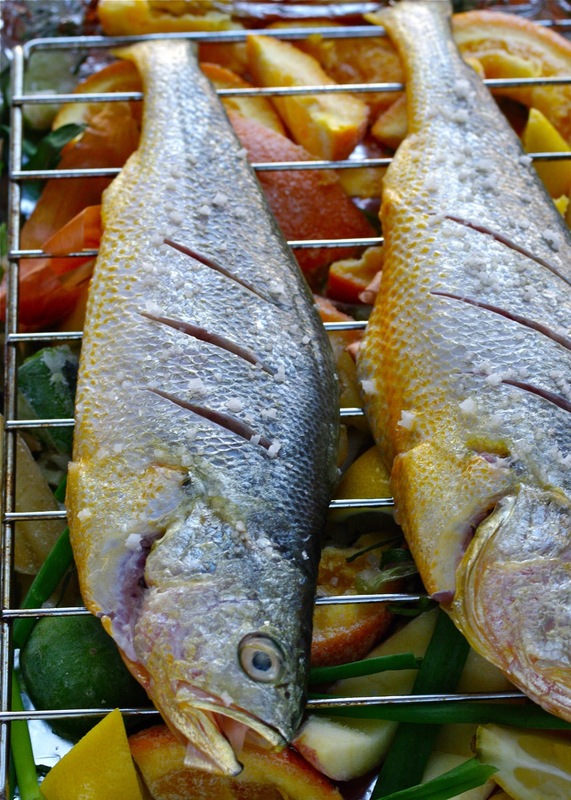 You might smell just a tiny bit when you open the oven to flip the fish to the other side. But it should be gone by the time when fish is all done. 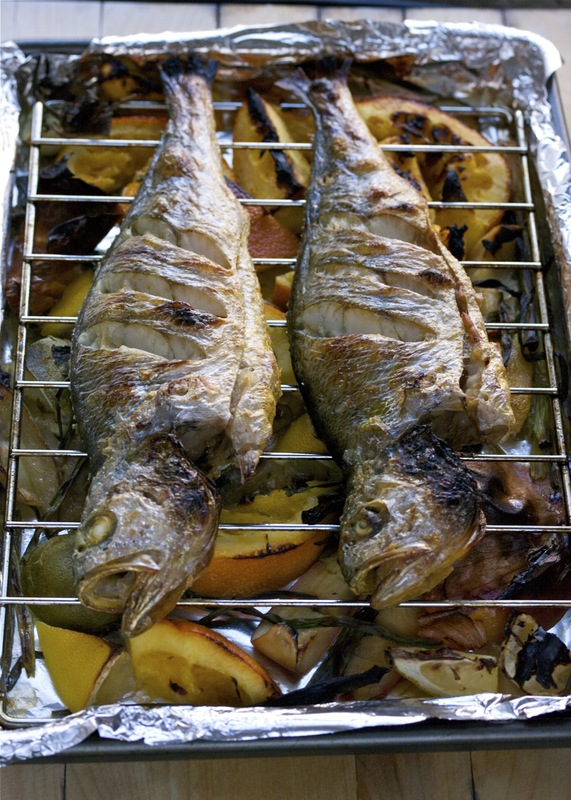 Here is the perfectly broiled fish. 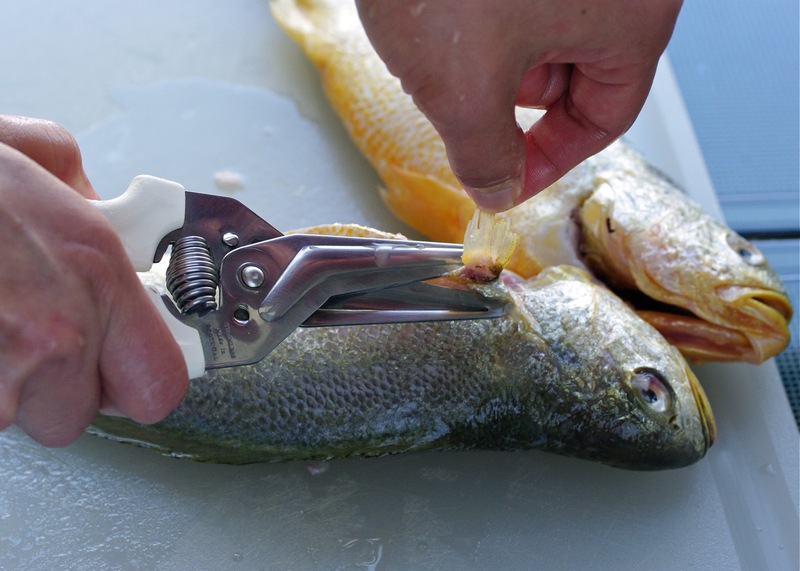 But how about the cutting board, knife, or your hands that cleaned these fishes? Yes, They will get smelly. You can use vinegar or lemon juice. But I use sugar, white or brown, and rub them. I don’t know how, but somehow it works. Your hands will feel so smooth, too. I usually serve this fish with Korean soy sauce (gook ganjang). A tiny bit of dipping is all you need. 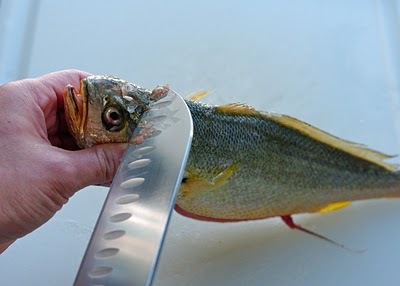 Remove all the scales on the fish including body, around head, behind fins. Wash them well. Trim off all the fins and sprinkle salt inside and outside of fishes. Place on the plate and cover with plastic wrap. Let it chill for 6 hours or overnight. 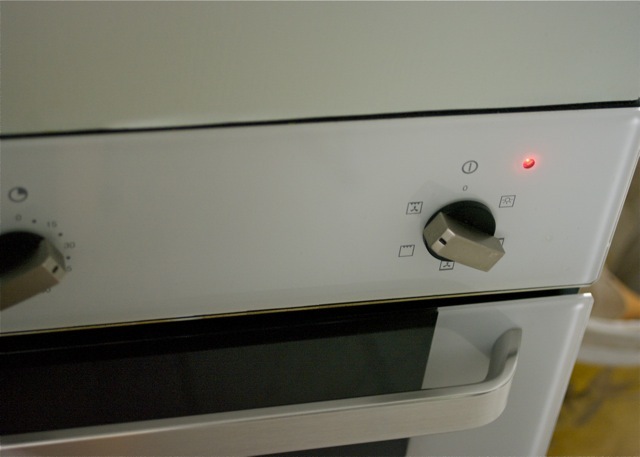 When ready, preheat your oven on broil setting. The rack should be about 3 inch from the heat. Wash the fish again to remove excess salt. Set aside. 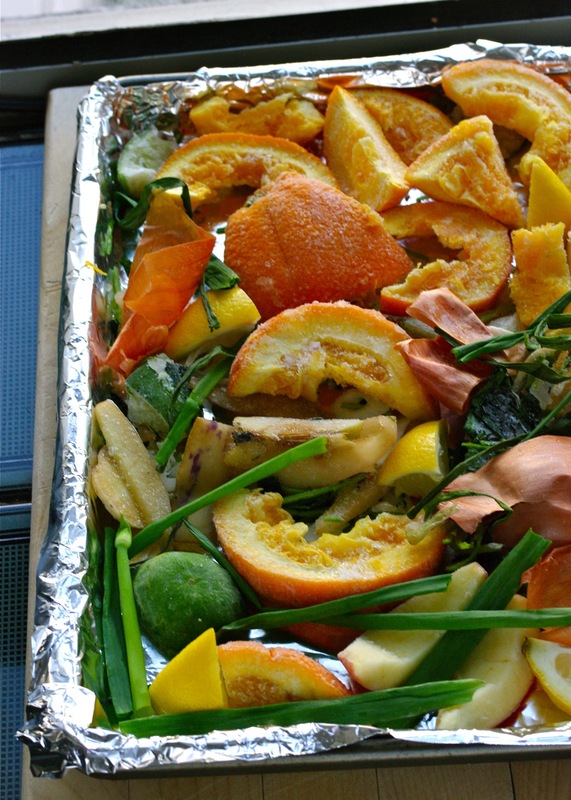 Line a jellyroll pan with foil and spread the frozen fruit and vegetable peels all around. 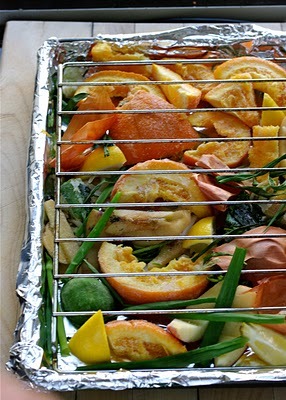 Spray a broil rack or mesh with oil spray and place on top of the peels. Give a few slits on both side of fish with a knife and place the fish on top of the pan. Place the pan in the hot oven with broil setting. 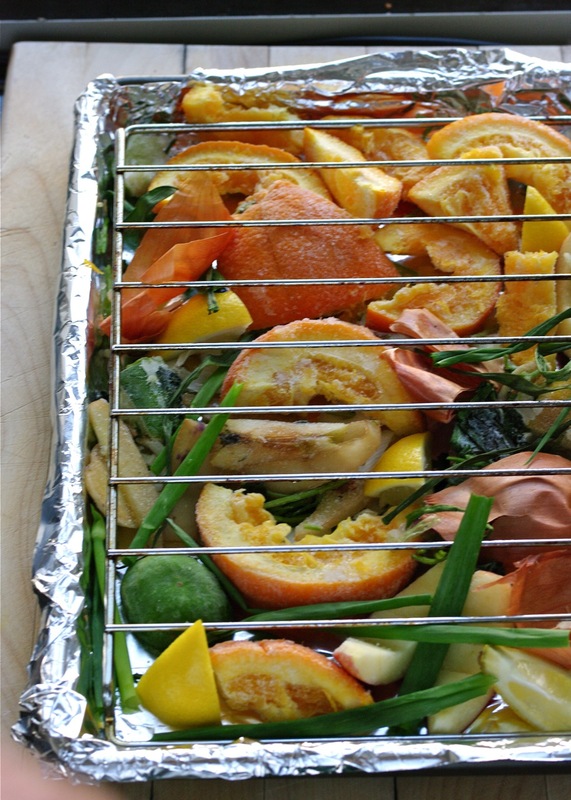 Broil for 8-10 minutes each sides. Carefully flip in between. Serve with Korean soy sauce if you wish. Dip bite size fish just a little bit in the sauce. 어제 김치님 블로그에 들어왔는데 오늘 또 왔어요. 감사해요. 생선의 비린 냄새를 과일껍질을 이용해서 없앨 수도 있고,저렇게 구우면 정말 맛있을 듯 해요. 보통 그냥 레몬정도 짜서 뿌려먹던것과는 다른 색다른 조리법이네요. Yes, I agree with you. We should support the local market. It is sad to see more and more small businesses disappear these days and replaced by big corporates. Thanks for the info about the chemicals. 저도 가끔 제 어머니가 정성껏 구워주신 생선구이가 그리울때가 많아요. 옛날 노래중 "어머니와 고등어"라는 곡이 생각나네요. 다음주에 고등어 한놈 구워먹을까봐요. I was in HK for the first time earlier this year and we stayed in Wan Chai--so nice to see it again to bring back the good memories :) I really enjoyed seeing the wet markets, and wished I had a kitchen to cook in! HK is quite charming place on its own. It is like East meets West culture that I love. Thanks for stopping by. 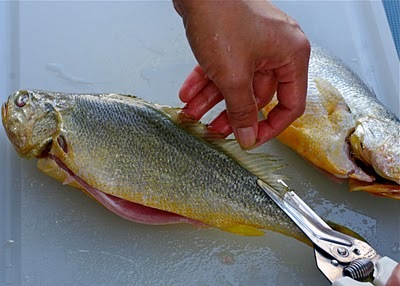 I had more tips on handling the yellow croaker. Thanks! Seriously, they looked so perfectly cooked that I can have two of them(yes, everything! ), then some sponge gourd soup. You have a wonderful blog!I followed you from the foodie blog roll and enjoyed reading your posts.If you wont mind I'd love to guide Foodista readers to this post.Just add the foodista widget to the end of this post and it's all set, Thanks! Now I understand.. was wondering where to get fresh kaffir leaves in the Us. It's so much fun going through all your blog, can't wait till you get back from your summer vacation. thanks for this tip! 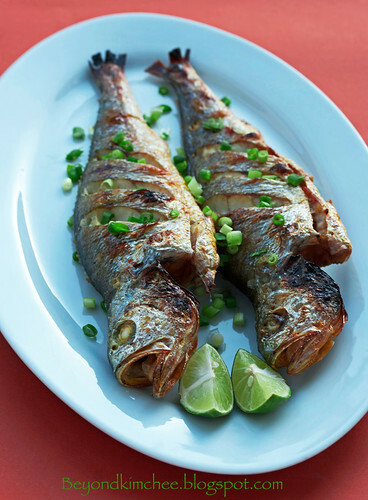 i usually pan fry my fish but next time, i'm going to try your method. love your blog! 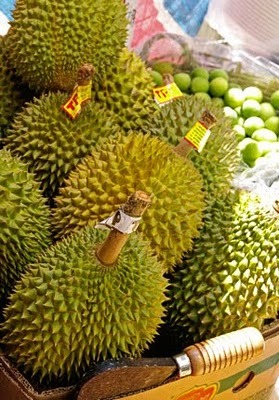 Just thought I would point out that the jackfruit you're referring to is actually a durian. You have a great blog though, keep up the good work. I enjoyed reading your blog..You are such an amazing mom and wife. Missed you guys! Your husband must be very lucky to have you. Cheers!! Have fun with 120 of them. That is a lot of work. Good luck! I love your post and recipes, they're always so interesting! Thanks for sharing. But can I make a comment about how you always make animal jokes with the meat.. It's not very funny and quite creepy. Like the fish saying how hot it is in the oven, the headless chicken, oink oink pig jokes or cow jokes. I know you're trying to make it a fun post but it's awesome enough. It feels rather insensitive to the animals..hope you know what I mean. Me and my wife have bought this fish very first time in our life. 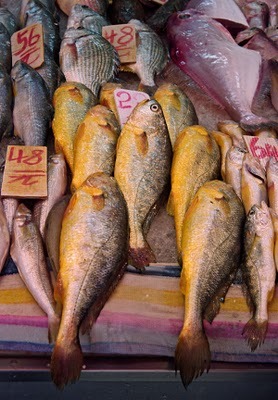 While having look at at the fish in local chinese grocery we assumed this fish might taste good. Today we were wondering what to do with this fish. We googled about this fish got some information and came across your blog. What a wonderful blog you have! Thanks for your all out informative, touchy and nice visual presentation. We will be in touch with your blog. Oh, I am glad that you found my blog, too. Hope you enjoy your fish and look forward to hear from you again. Thank you so much for posting and sharing this recipe. Today was my first visit to the Korean market, and I got some yellow Crocker, salted and flattened already for cooking. I'm so exited to try your recipe and make a beautiful healthy dish with some whole wheat noodles and some crunchy greens. I also bought some fresh green jujubes, we ate them raw but I would love to find a great recipe for tea and jujube preserve. any ideas anyone?